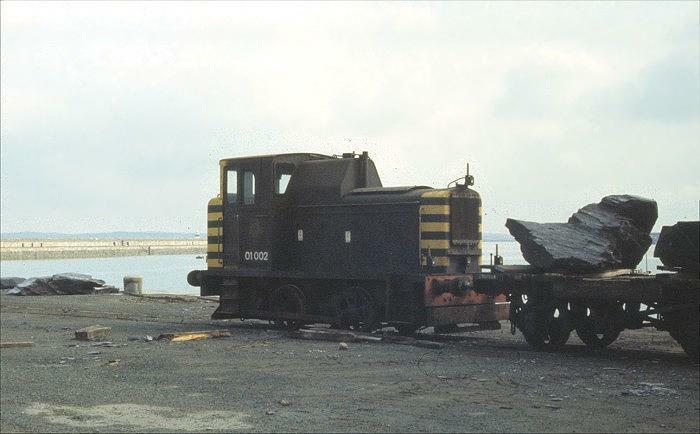 There are several other pictures on this theme on the Holyhead page, but I can't resist another picture of Holyhead's unique little railway and its Class 01 loco, 01 002. I have made many visits to Holyhead, but the 15th April 1979 was one day that still remains in the memory 25 years later, when I drove along Beach Road and saw across the harbour the little loco and its four wagons out on the breakwater. The train returned to the shore for the lunch break, and was parked in the loading siding. Lighting was a bit tricky, with a bright sky but some cloud cover, and its taken digital scanning to bring out the best of the photographs taken that day.